On 13 May 2013, His Holiness Patriarch Kirill, currently on a visit to China, visited St. Sophia Cathedral in Harbin. He was accompanied by Ambassador Andrei Denisov of the Russian Federation to the People’s Republic of China, Mr. Sergei Paltov, Russian Consul General in Shenyang, Mr. Zhang Lebin, deputy director of the State Administration for Religious Affairs under the State Council of the People’s Republic of China, and members of the official delegation of the Russian Orthodox Church. Staff members of the municipal architecture and art museum housed in the building of the cathedral told His Holiness about its history. 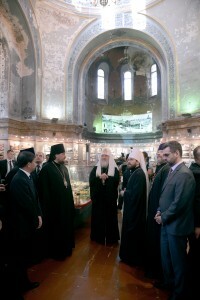 Patriarch Kirill recalled the destruction of Christ the Saviour Cathedral in Moscow and underlined the importance of preserving any traces of Russian presence in China for the development of relations between China and Russia. His Holiness and his suite sang Paschal troparion.